Christmas movies started on Hallmark this weekend. Both the Hallmark Channel and Hallmark Movies & Mysteries. They even had their first new premier Christmas at Pemberly Manor. I was not sure if I would like that one being such a Pride and Prejudice fan but I did. The only bad thing, my Christmas movies kept getting interrupted by Halloween commercials. I have to admit I even listened to Christmas music this weekend. I hope everyone had a good Christmas. Mine was good, but in the blink of an eye it was over, it seems. And today I am dragging. Work, dinner, church on Christmas Eve. Up early for Christmas morning with the kids, home for a quick nap before back out the door to my aunts. Back to work this morning and working all four days. I am sure glad I took off the day after New Year’s Day, I’m going to be trying to catch up on sleep. But I loved every minute of spending Christmas morning with the kids. A few years ago, I got the chance to go to Disney in early November. The first day when I walked into the Magic Kingdom it was still fall but within two days it was Christmas. While the Christmas celabration had not officially started the castle was all aglow. 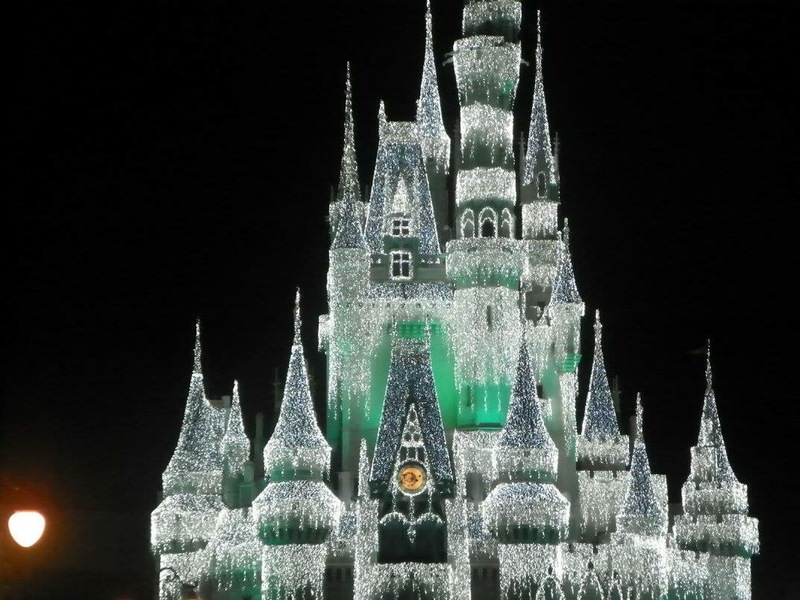 This will probably be the closest I will get to Disney at Christmas so I am truly thankful for it and I’m glad I can say I’ve seen the castle glowing in lights. Sorry, it has been a long time since I posted last. Blogging and having to share your computer do not mix well. But Santa took care of that problem today, Mom got a new laptop for Christmas and this Southern Belle gets her laptop back! I am currently doing lots of research on how to make my blog better, so hopefully in the New Year there will be a new and improved Southern Belle Charm. Thank you for reading and I will catch up with you soon.